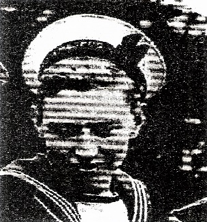 The following paper describes the experiences of a young Royal Navy conscript, Gordon Cansdale who served in the Fleet Air Arm from 1945 to 1947. 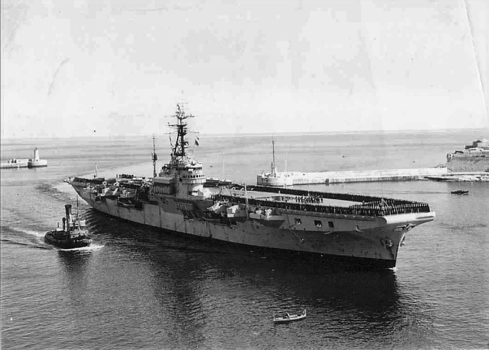 Gordon describes the highs and tragic lows of service in the carrier HMS Theseus which visited Australia in 1947 to demonstrate naval air power and the capabilities of an aircraft carrier. Gordon later settled in Australia where he has lived for more than 63 years. The old saying that one only remembers the good times can be quite true, but in my case there was one bad time in particular that I will never forget. Years ago, (1945) I received notice that I was to be conscripted into the armed forces. I was hoping that it would be the Navy as my father had served in the Navy in the 1914-18 war. YES!! I was selected for the Royal Navy, better still, the Fleet Air Arm, a dream come true. Fighter aircraft, Rolls Royce engines, a chance to see the world, and of course a navy uniform. So, my adventure began by first learning how to march, handle firearms, and not forgetting plenty of naval discipline. Next step was the Rolls Royce School of Technical Training. THIS WAS IT!! learning about the mighty Merlin engine. On completing this course, I was posted to a shore establishment HMS Blackcap inhibiting engines for storage. This didn’t last long, as I soon learned that I had been given a sea-going draft. I was to become a member of 812 Squadron (Fireflies) and join HMS Theseus in Ireland. After a short training period ashore in N. Ireland it was off to see the world. Those faraway places with strange sounding names. Gibraltar, Suez, Aden, Trincomalee, Andaman Islands, Nicobar Islands, Singapore, Australia, New Zealand, New Guinea. The reception we received in Australia and New Zealand was just great. The street marches with the whole ship’s company through the streets of Melbourne, Sydney, Brisbane, Auckland and Wellington. The people were just fantastic, with dances and sight-seeing trips. They also organized home visits, and food parcels for our families back home. BUT! it wasn’t all plain sailing, whilst flying and demonstrating for the Royal Australian Navy there were several disasters. Two Fireflies collided in midair over Port Phillip Bay and crashed into the sea killing both air crews. One of the engines was pulled up out of the sea some fifty years later, and is now in the Australian F.A.A. Museum in Nowra which I often visit with an old ‘oppo’ Totty Allman. 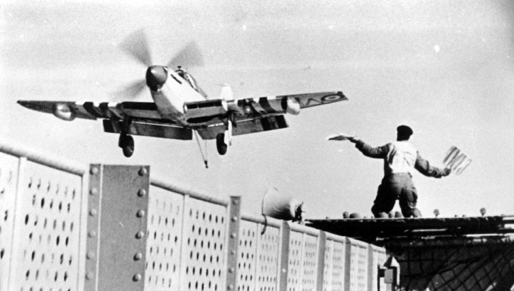 The same day a Seafire crash landed on deck, the arrester hook striking a seaman in the walkway and killing him. For me the worst was yet to come (my disaster day). It was the job of the ground crew to assist the pilot out of the cockpit on landing. I was the fitter of the Squadron CO’s aircraft (Lt Cdr Wynne-Roberts) and would compete with my rigger mate ‘Spiv’ Daly to be first up on to the plane to do the job. The winner would then have pole position sitting on top of the cockpit to watch the remainder of the aircraft land. It was 6th August 1947 and Spiv had won the race, sitting on top of the cockpit, I had to settle for a seat on the wing. The next aircraft landed OK, the crash barriers were lowered and it taxied forward. THEN ALL HELL LET LOOSE. The third aircraft missed the arrestor wires and bounced over the crash barriers. To my horror I realised it was heading straight for us, so I dropped off the wing and ran for the ship’s side. It then clipped the second aircraft and dropped on top of ours. On impact, debris was showered everywhere, and as I was dropping into the safety net, the batteries burst and I was splattered with acid. Minutes later I was lifted out of the safety net and rushed below to sick bay, washed down, and treated for acid bums. My clothes had to be replaced as they were covered in holes, burnt by the acid. I asked about Spiv and was told that he was missing, presumed killed. I couldn’t believe that I was with him just a short time before, and the last person to see him alive. Could easily have been me. The things I will always remember are the noise of the plane bouncing, the terrific noise of the impact, and someone shouting “There’s somebody down in the net” ME!!! As they lifted me out there was a wheel, and Oleo leg nearby. All that remained of two aircraft. When the deck was finally cleaned up, the last aircraft carne in to land, also bouncing over the crash barriers. It clipped the Island before crashing into the starboard gun sponson, then tipped over nose first into the sea. Luckily the aircrew were recovered safely. From Australia, our next port of call was the Solomon Islands which was very interesting as there were ships and a submarine on the beach, Jap relics of the war a couple of years previous. Port Moresby in New Guinea was also interesting, with a trip out to. Jackson airstrip which still had the odd Zero fighter, and a Betty bomber smashed up. Also, a wine bar. Back to Singapore where I learnt I was to leave Theseus and return home for demob with others who had the same demob number as me (72). The rest of my service was spent at HMS Nuthatch, doing maintenance, cutting grass, painting fences etc. Finally, my demob and the end of a great adventure with many good times, and a few bad. Plus, many great friends, and a lot of MEMORlES. MIDN Lachlan Montgomery joined the RAN in February 2014 coming from a family of five in Ringwood Victoria. His father is a serving member of the Victorian Police Force and his mother an office manager at the Ringwood High School. He enjoys running, computers and flying with the career goal to become an Aviation Warfare Officer. The involvement of the RAN and the significance of the battle to Australia. The great war between the US and Japan opened in a totally unexpected manner. The destruction of much of the United States Pacific Fleet at Pearl Harbour was a huge blow to their tactical capability. However, as a result of all its Pacific aircraft carriers not being present at Pearl Harbour during the attack, the United States considered how to use these ships to reverse the Japanese expansion across the Pacific. (Stille). Stillestates that as a result of the Japanese success at Pearl Harbor, air power was now considered a dominant factor in naval warfare. In order to avoid being totally defensive in the face of an unstoppable Japanese carrier force, the United States began a series of carrier strikes in the Central and South Pacific. These proved somewhat ineffective, but forced the Japanese to postpone their proposed Port Moresby operation. When the Japanese were ready to move on New Guinea in the South Pacific, two of the US Pacific Fleet Carriers had been deployed to conduct a raid on Tokyo, meaning the US could only send two carriers to the South Pacific to counter thepredicted Japanese offensive. With part of the Japanese Carrier Force committed to join theSouth Pacific operation, history’s first aircraft carrier battle seemed imminent. Millot (1974) contends that the war in the Pacific led to a new kind of warfare – one which relied on the use of air power. In fact, the Battle of the Coral Sea was based around a type of warfare where the opposing carrier groups never sighted nor fired upon each other. The Carrier Air Groups of both sides were primarily made up of three types of aircraft. These consisted of fighters, dive bombers and torpedo aircraft, forming a ‘Combat Trio’ with the goal to project overwhelming force upon the enemy ships. As a primarily carrier only battle, these aircraft would prove vital to the attack of enemy forces – a new kind of ‘Over the Horizon warfare’ emerged. The Japanese and Americans had very different aircraft design philosophies as seen below in figure 1. As shown above, the Japanese utilised lightweight, manoeuvrable and fast aircraft with high rates of climb. This came at the cost of reduced pilot protection, armour and special features such as self-sealing fuel tanks. The Americans however, had the slower, heavier Wildcat, inferior in almost every way to the Japanese Zeros apart from its stout construction. This interesting comparison proves the uniqueness of each carrier force and a few of the strengths/weaknesses of each. Overall, the Battle of the Coral Sea had the strategic effect of ‘promoting’ the aircraft carriers’ importance to naval warfare, and thus resulted in a dramatic increase in numbers of these ships produced. It also essentially removed the battleship from the elevated position it held as the ‘flagship’ of navies worldwide and presented air power with utmost importance for future naval engagements. The Battle of Midway which occurred in early June 1942 is proof of this. Intelligence proved vital to the outcome of the Battle of the Coral Sea. As an over the horizon carrier battle, seaplanes were the primary method of predicting the next moves of the enemy forces. Australia played an important role with intelligence. Coastwatchers were on the job, spotting Japanese seaplanes as they departed their forward bases at Lae and Salamaua on the north eastern coast of New Guinea. The Australians observed the routines of the Japanese and hence discovered they had begun to mass air and sea power in the area – pointing to an attack on Port Moresby. This knowledge was a contributing factor to the American deployment of sea power to the area in anticipation of a clash (Hoyt). Signal interception was also a means of intelligence prior to the battle. A joint USN/RAN Unit known as Fleet Radio Unit Melbourne (FRUMEL) played an important role in the Battle of the Coral Sea. US Naval Intelligence was able to decode Japanese naval communications and as such was almost as well informed as to what was being planned as Japanese commanders were (Straczek). On 13 April, the British intercepted a Japanese message stating that the ‘Fifth Carrier Division’ was en-route to the area. Upon receipt of this intelligence from the British and confirming its authenticity, the US deployed all four of the Pacific Fleet’s available carriers to the area. Only two of these carriers, USS Lexingtonand USS Yorktownwere able to make it to the area of operations in time due to USS Hornetand USS Enterpriseconducting a raid on Tokyo. Interestingly, the Japanese believed only one American carrier was in the area of their planned operation, and did not expect such a strong carrier response to their invasion until it was well underway. This perhaps had a serious effect on Japanese performance during the battle, as they hadn’t expected the large American force present during their operation. Therefore it can be said that intelligence had a significant impact upon the conduct of the battle, primarily involving American predictions of Japanese movements, and the subsequent deployment of carrier groups to the area. We must also not forget that the Japanese intelligence in this situation was inferior to that of the United States, demonstrated by their underestimation of US carrier power in the region. This is a vital lesson in the importance of intelligence in this kind of ‘blind’ warfare. (Straczek & Hoyt). There is no doubt the Battle of the Coral Sea had a heavy impact on both the Americans and the Japanese, but who really won? There are claims of a tactical defeat along with strategic victory from the American point of view. Stille states that the battle has correctly been described as a strategic American victory. The Americans had, for the first time, repelled a Japanese attack and subsequently prevented the Japanese sea-borne invasion of Port Moresby. This attack was Japan’s best chance at taking the port and airfield, and hence posing a major threat to Australia’s security. The failure of the sea approach resulted in the later failed attempt to take the port by land over extremely rough terrain. So in the sense of a wide viewed approach, the United States had a strategic victory during the Battle of the Coral Sea. Some possess the view that whilst a strategic victory, the battle was a tactical defeat for the US Navy. This can be attributed to the fact that whilst sinking only a light Japanese carrier Shohoand damaging a fleet carrier Shokaku, the US Navy lost Lexington, one of its four operational fleet carriers. Observing from an isolated perspective, this ‘tactical defeat’ could be considered true, however looking back to the broad strategic overview, this is not accurate, as the primary Japanese goal of achieving carrier dominance over the Americans had failed. Therefore it is apparent that whilst some considered the battle an American tactical defeat, the disabling of a large portion of the Japanese Carrier Force paid rich dividends for the American position in the Pacific. As previously mentioned, the halt of Japanese naval advances on Port Moresby resulted in a land campaign over increasingly difficult terrain. This Japanese attempt proved to be unsuccessful, meaning that Port Moresby remained under Allied control. Resultantly, Australia was protected from the threat of invasion. It can be said that the Battle of the Coral Sea had a huge impact upon events ashore in Papua New Guinea, not the least of which was the survival of Port Moresby. Had this important port been taken in a Japanese naval assault, the enemy would have aimed to cut off Australia and its important contribution to the war effort. The consequences of this occurring would have been disastrous to Australia. The Royal Australian Navy had a significant involvement during the Battle of the Coral Sea. A Support Group attached to Task Force 17, the American Carrier group, consisted of HMAS Australia and HMAS Hobart as well as several USN ships. This group was headed by Rear Admiral J.G Crace of the Royal Navy. After being split from the carrier force to cover the Jomard Passage and intercept the Japanese invasion force as it exited, the support group became the target of heavy bombing and strafing attacks. After repelling these attacks, the group was free to intercept the Japanese invasion force. However Admiral Inouye, in charge of this invasion force, reversed his ships whilst they clarified the sightings of ‘battleships’ in the area. Had Crace’s ships not been detached from Task Force 17, the Japanese force would have been able to enter Port Moresby, resulting in grave consequences for the Allies. As mentioned previously, Australia was a vulnerable target which relied greatly on Port Moresby for its security. The Battle of the Coral Sea resulted in Australia being protected from the threat of imminent invasion and supply lines between the United States and Australia remained open. It was also the first time Australian ships had been involved with a major US carrier group, a proud moment in history indeed. (Jacobsen). Many lessons were learnt from the Battle of the Coral Sea, the first of which being the immense importance of air power in future naval engagements. As a new kind of ‘over the horizon’ warfare had emerged, it became apparent that aircraft would be vital to the success of any kind of naval warfare from that point onwards. Intelligence also proved to be an extremely important factor in deciding the victor in naval engagements. The Americans having effective intelligence prior to the Coral Sea battle meant they were able to deploy their carriers to the area, possibly changing the tide of the war in the Pacific. Despite losing a quarter of its carrier strength, the US had a strategic victory during this battle, one that assisted their position for later conflicts in the Pacific region, particularly the Battle of Midway. The Coral Sea battle held significant strategic importance insofar as control of Port Moresby being maintained by the Allies and in regard to the security of the Australian mainland. The Royal Australian Navy’s contribution, although small in the scheme of things, was significant and contributed to the final result not just during this battle but throughout the Pacific War. Frame, T., The Battes that Shaped Australia. St Leonards: Allen & Unwin, 1994. Hoyt, E.P., Blue Skies And Blood – The Battle of the Coral Sea. New York: iBooks, inc., 1975. Jacobsen, M., The Battle of the Coral Sea 1942– Conference Proceedings 1992. Sydney: Australian National Maritime Museum, 1993. Macdougall, A., Australia’s Navy. Waverton: Waverton Press, 2005. Millot, B., The Battle of the Coral Sea. United States of America: Naval Institute Press, 1974. Stille, M., The Coral Sea 1942 – The First Carrier Battle. Great Britain: Osprey Publishing, 2009. Straczek, J., Battle of the Coral Sea. [Online] Available at: https://www.navy.gov.au/history/feature-histories/battle-coral-sea[Accessed 7 October 2014]. A summary of this paper was presented at a conference held from 30 September to 01 October 2014 at the Universidad Andres Bello, Chile on the maritime history of South America throughout WWI. Important men mostly leave behind them a written trail of evidence of their passing. Admiral Sir George Patey is an exception with no voluminous book or memoirs following in his wake. However there are plentiful references to his time as commander of the Australian Fleet and from these and other sources we are able to find out something about this remarkable man and his importance to Australian naval history. 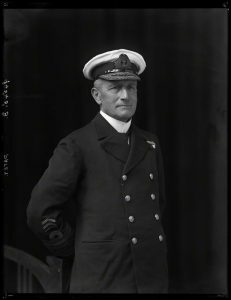 On 4 March 1913 the Admiralty announced that Rear Admiral Patey had been appointed to the command of the Australian Fleet. The Times of that date commenting upon the appointment says: Rear Admiral Patey is an officer of wide experience and high attainment, and he is well qualified by his tact and temperament for the new post. And new post it was, as Rear Admiral commanding the Australian Fleet replacing the Royal Naval Commander-in-Chief of the Australian Station. That change however was a little way off as the new Australian Fleet was at this time being assembled in England and would not sail from Portsmouth for their new homeland until July 2013. George Edwin Patey was born at Montpellier near Plymouth on 24 February 1859 to a naval family, his father a Captain in the Royal Navy having the same name set and his mother Lucinda the daughter of Vice Admiral Thomas Russell. He entered the Royal Naval College as a cadet on 15 January 1872, just shy of his thirteenth birthday. Young Midshipman Patey’s first sea posting was to HMS Shah. Shahwas commissioned in Portsmouth on 14 August 1876 by Captain F.G.D. Bedford, RN carrying the flag of Rear Admiral Algernon Frederick Rous de Horsey, Commander-in-Chief of the Pacific Squadron. She was a large composite (sail and steam) frigate of over 6,000 tons, built with iron frames but wooden clad and armed with 26 guns and 4 torpedo launchers. Patey’s first taste of action was off the Peruvian coast on 29 May 1877 during an engagement (later known as the Battle of Pacocha) between Shah and HMS Amethyst and the Peruvian rebel turret ship Huascar. The armoured Huascar proved virtually impenetrable to British guns and Shah fired the first British torpedo used in anger, but it missed the target and Huascar escaped. On Shah’s return voyage she was diverted to South Africa to assist in the Anglo-Zulu War. Sub-Lieutenant Patey was sent ashore to fight with a naval brigade and received the Zulu Medal. Upon return to England with promotion to Lieutenant in August 1881 he joined the gunnery school HMS Excellent and after completing his course remained on the staff. In May 1885 came a posting to the gunnery training ship HMS Cambridge then based at Plymouth. The following year he moved to more distant shores in the corvette HMS Sapphire for squadron gunnery duties on the China Station. He then returned to Cambridge as Senior Staff Officer in 1889 and was later lent for staff duties in the Mediterranean Fleet. Promoted to Commander in 1894 he served as Executive Officer of the battleship HMS Barfleur during the Allied occupation of Crete in 1897 following the Greco-Turkish uprising on this island. Patey was appointed to the Naval Intelligence Division in 1899 and on promotion to Captain on 1 January 1900 became Assistant Director of Naval Intelligence. This was an important time in the future development of naval ships and armament giving rise to the Dreadnought era and the impending arms race with Germany. On 12 March 1902 Captain Patey married Mary (Mollie) Augusta Yorke-Davies, the only daughter of the eminent Harley Street physician Dr Nathaniel Yorke-Davies. They were later to have two children, Rodney and Lorna. Lady Mary is remembered as an elegant chatelaine of Sydney’s picturesque Admiralty House with a Sydney newspaper columnist referring to her as ‘gay, natural and full of enthusiasm’. Somewhat unusually Patey, who had never held command, was in November 1902 appointed Captain of the newly commissioned battleship HMS Venerable,flagship of Rear Admiral Mediterranean Fleet. In 1905 a second command beckoned in the same fleet as captain of another battleship HMS Implacable.For a big ship man in a hurry there was a quiet period when in November 1907 he became Inspecting Captain of Boys’ Training Ships. At this time the Royal Navy received most of its recruits from these training ships who were well grounded in naval routines and proved excellent seamen. This sinecure was not to last long with promotion to Rear Admiral on 2 January 1909 and later the plum posting in the Home Fleet as commander Second Division of the Second Battle Squadron. Since federation of the Australian colonies in 1901 and formation of a Commonwealth Government a greater degree of independence was sought from the Imperial authority which extended to local command of defence forces. Amalgamation of colonial forces took time and replacement ships were sought to meet the needs of the newly formed Pacific nation. A small but well balanced force of new ships was built and Britain and by 1913 these were being readied for their voyage to the far end of the world. Rear Admiral Patey’s appointment as the first commander of an Australian Fleet may have been influenced by the following. Firstly Sir George Reid, an advocate of Federation and former Prime Minister, who in 1910 became High Commissioner in London with a responsibility for overseeing construction of the Australian fleet – Lady Florence Reid launched HMAS Australia.Second was the influential retired naval captain Robert Muirhead Collins (later Sir Robert) who was the initial Secretary of the Commonwealth Department of Defence before his appointment as Official Secretary to the High Commission. The final member of this interest group was Admiral Sir Reginald Henderson1who was instrumental in designing the structure for an Australian Fleet. Admiral Patey’s Australian Service Record shows little of interest other than that he was appointed as a Rear Admiral in the Permanent Naval Force (PNF) on 23 June 1913 for a period of at least two years at a salary of £1,095.00 pa with Table Money of £1,642.10. On 14 September 1914 he was appointed a Vice Admiral in the PNF at a salary of £1,460 pa with the same Table Money plus War Service pay of £409 pa. The famous Admiral Sir John (Jacky) Fisher is credited with modernising the Royal Navy and will forever be associated with the new type of battleship HMS Dreadnought which made other capital ships obsolete. Following this success Fisher envisioned another slightly smaller ship with similar offensive power but greater speed. To achieve this, armour protection was sacrificed for greater speed in a new type of vessel called a battle-cruiser. In 1905 the first of a new Invincible class was laid down. After lessons learned from their service three more improved Invincibles commenced, HM Ships Indefatigable and New Zealand and HMAS Australia.Each was of 18,800 displacement tons, with a length of 590 feet (179.8 m), 80 feet (24.4 m) beam and 30 feet (9.2 m) deep draught. Their armament comprised 8 x 12-inch, 14 x 4-inch guns and 2 x 18-inch torpedo tubes. They had a maximum speed of 25 knots, an economic endurance of 6,700 nautical miles and complement (as flagship) of 850 men. Later experience at the Battle of Jutland demonstrated shortcomings in their design when three battle-cruisers were sunk. Interestingly at this time the battle-cruiser Kongo was also being built in England for the Imperial Japanese Navy and she sailed from Portsmouth a month after Australia.With the latest 14-inch guns Kongo was one of the most heavily armed ships in the world. Following successful gun, torpedo and machinery trials Australia commissioned at Portsmouth on 21 June 2013, under the command of Captain Stephen H. Radcliffe, RN. The battle-cruiser was inspected by HM King George V on 30 June 2013 and on that occasion Rear Admiral Patey received the singular honour of being knighted by his sovereign on the quarterdeck of Australia,an honour first bestowed by Queen Elizabeth on that legendary English hero and bane of the Spanish Main, Sir Francis Drake, some three centuries before. On 21 July 1913 Australia sailed from Portsmouth and proceeded via Cape Verde (taking on 2,000 tons of coal) to Cape Town. Here she met with the new light cruiser HMAS Sydney which had departed from England before her. The locals turned out in force to welcome the visiting ships and were keen to compare the battle-cruiser with her sister ship New Zealand which had visited a few weeks earlier on her homeward voyage. The two ships then proceeded to Jervis Bay where they were joined by the cruisers HMAS Melbourne and HMS Encounter(on loan from the RN) and the destroyers HMA Ships Parramatta, Warrego and Yarra and readied themselves for an official fleet entry into Sydney Harbour. The arrival of the first Australian Fleet in Sydney on 4 October 1913 was a platform for celebration and rejoicing – the nation had come of age. In those times public figures were often remote and courting media attention was unusual. It was therefore something of a coup when two days later on 6 October that the then Vice Admiral Sir George Patey granted an interview to a correspondent of the Sydney Morning Herald. A few weeks previously he had a similar dialogue with a newspaper correspondent in Cape Town. In keeping with the traditions of ‘The Silent Service’ these interviews were restricted to precisely five minutes. A summary taken from these newspapers provides a personal glimpse of the man. He is 54 years of age, of medium height, with aquiline features and iron grey hair. There is an engaging smile beneath sternly set features, which underlies a genial personality. Like the majority of sailors he is a modest public speaker but demonstrates a degree of eloquence. He is an admirer of the Henderson Scheme for naval defence. The Admiral noted that half of the men under his command were Australian and they came with good physique. The other half were from the Royal Navy or the Reserves. It would take some time to train all of these into a cohesive unit but they were all the same to him, he said, and they would all be officers and men of the Royal Australian Navy. He noted the opportunities in the Royal Australian Navy were greater than in Britain for promotion and that the pay was much better. To those on the lower deck, often with discerning powers of observation, their Fleet Commander was known as ‘Gentle Annie’. A popular song of this period had lyrics which included: Fair and lovely Annie, Your gentle ways have won me. Their observation is possibly a parody on stern looks but a gentle demeanour. The Japanese cruisers Chikuma and Ibukialso supported the Australian Fleet early in WWI. At the start of the war there were 3,800 men in the PNF and 1,646 (mainly Reservists) in the Naval Brigade. At its peak, before large scale demobilisation in 1919, these numbers had increased to 5,250 PNF and 2,817 in the Naval Brigade. In addition there were 3,092 cadets under compulsory training schemes at the start of hostilities which had increased to 3,834 by 1919. Of the PNF figures, about twenty per cent were on loan from the Royal Navy. On 2 August 1914 the Australian Naval Board established an Examination Service to check arrivals and departures of shipping at defended ports. Two days later on declaration of war this led to the capture of a number of German merchant ships that were in port or within Australian waters. On 3 August the RAN was placed under Admiralty control; on the evening of the same day the German passenger liner Seydlitz managed to slip quietly out of Sydney Harbour and make passage to Chile where she joined von Spee’s squadron. While the Great War, afterwards known as WW I, was mainly a European conflict, it extended into the Indian and Pacific theatres as the Allies pursued the conquest of German colonies, closed German merchant trade and eliminated the threat from German naval forces. The most significant military action was the Japanese siege of Tsingtao, in what is now China, but smaller actions were also fought in German New Guinea and German East Africa. The German Navy also skilfully used commerce raiders and mined Australian and New Zealand waters with significant effect. Patey’s ships were also responsible for protecting convoys carrying troops and provisions to the Middle East in support of the Mother Country. In August 1914 the only direct threat posed to both Australia and New Zealand was from the German East Asiatic Squadron, principally comprising the armoured cruisers Scharnhorst and Gneisenau, and light cruisers Nurnberg, Leipzig, and Emden, under the command of Vice Admiral Maximilian Graf von Spee. The light cruiser Dresden, at this time in the West Indies, made haste south to join von Spee, just managing to elude a British squadron under command of Rear Admiral Sir Christopher Cradock making its way down the east coast of South America and she was able to transmit to von Spee details of Cradock’s squadron. Dresden joined her sisters off Easter Island on 12 September. Another ancient light cruiser Geier, operating off German East Africa, also attempted to join von Spee but was hampered by being low on fuel and with mechanical problems, forcing her to make to the neutral port of Honolulu. Here she was hemmed in by Japanese cruisers and was eventually interned by the United States. The only Allied naval ship in southern waters that could outclass the enemy was Australia, as by this time New Zealand had returned to the First Battle Squadron of the Grand Fleet. New Zealand commenced her return journey leaving Auckland in June 1913 making a leisurely passage across the Pacific as far north as Vancouver before proceeding south, two years before the opening of the Panama Canal2, with calls at Callao and Valparaiso before rounding Cape Horn and making her way to Britain where she arrived in November 1913. During this period the New Zealand Station remained dependent upon naval support from the Royal Naval China Station with an allocation of four older light cruisers and one sloop. While the Royal Navy outnumbered all other nations in the size and strength of its fighting ships it had allowed its China Station to decline in favour of building its forces in the Home Fleet to combat an increasing German presence. In August 1914 the China Fleet under command of Vice Admiral Sir Martyn Jerram had the cruisers HM Ships Monitor, Hampshire and Yarmouth and five destroyers at his disposal at his main base of Weihaiwei. The battleship HMS Triumph3, the light cruiser HMS Newcastle and the French cruiser Duplix were further south at Hong Kong. The East Indies Station based at Colombo had been reduced to the obsolete battleship HMS Swiftsure4and the light cruiser HMS Dartmouth. 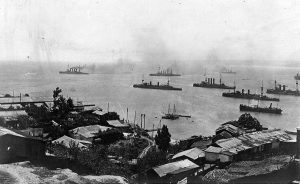 The Imperial Russian Fleet at Vladivostok was depleted by the Russo-Japanese War with new tonnage going to the Baltic Fleet. The flagship Zhemchug when visiting Penang was to meet Emden with devastating results. Although not required by the 1902 Anglo-Japanese Alliance, Japan pledged support to Britain and formally declared war against Germany on 23 August 1914. While the European navies might not yet consider Japan an equal and doubted its capabilities, Japan had a vast fleet of 14 battleships and battle-cruisers, 13 armoured cruisers, 10 light cruisers and 50 destroyers and other vessels. As time would tell its standards of training were of the highest order and its ships highly efficient. Immediately upon entry into the war Japanese forces were concentrated as the major partner in an Anglo-Japanese assault on the German fortress and naval base of Tsingtao (modern Qingdao) which was known as the Gibraltar of the East. The German garrison was stoutly defended and did not surrender until 7 November 1914. Admiral von Spee had left behind an antiquated Austro-Hungarian cruiser Kaiserin Elizabeth and some small craft which were lost in battle. In turn German torpedo boats sank a Japanese cruiser and a destroyer. It was a vicious siege with over 2,000 Allied (mostly Japanese) casualties and 700 German casualties. While the Japanese Second Fleet was involved at Tsingtao, ships of the First Fleet joined with British, French and Australian ships in searching for von Spee’s cruisers. The Japanese also took the opportunity to increase their footprint in the Pacific through the capture of German colonies in the Caroline Islands, Marshall Islands and most of the Mariana Islands. Belatedly another British naval squadron under Rear Admiral Sir Christopher Cradock was dispatched around Cape Horn to plug the remaining escape route open to the Germans. The Fourth Cruiser Squadron which also doubled as a training squadron was renamed the South Atlantic Squadron. It mainly comprised obsolete ships and was not a front line unit suitable to take action against a determined and superior enemy. Pre-empting further Japanese expansion south of the equator, both Australia and New Zealand quickly formed expeditionary forces leading to the capture of German colonies. The first land offensive was the occupation of German Samoa by New Zealand forces. 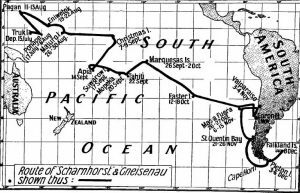 The campaign to take Samoa ended without bloodshed after over 1,000 New Zealanders landed on the German colony, supported by an Australian and New Zealand squadron led by Australia and the French cruiser Montcalm. In August 1914 the Australian Government raised an Australian Naval and Military Expeditionary Force of 1,500 Army volunteers and 500 men from the Naval Brigades to secure German colonial possessions to the north of Australia. These troops were transported in the P&O liner Berrima which had been commissioned into the RAN. After a sweep of New Guinea waters by Patey’s squadron with no sight of von Spee’s ships a detachment from the Naval Brigade landed to silence a radio station at Bita Paka. They were repulsed by German led native troops but with reinforcements the radio station was captured with minimum casualties. It took several more days to reach the headquarters of the German Governor at Tooma and he proved obstructive. But following a bombardment by Encounter the German territories were surrendered on 17 September. Tragically the submarine AE1which was on patrol off Rabaul on 15 September was lost without trace with her crew of 34 officers and men. With the capture of two small German ships most of the squadron was dispersed with Encounter sent to patrol between Fiji and Samoa on the lookout for enemy ships. The German East Asia Squadron – We seek him here – We seek him there. The elusive Scarlet Pimpernel who frustrated French authorities in their search for him gave rise to that famous parody ‘We seek him here – We seek him there’. Maximilian Graf von Spee became such a character frustrating a huge Allied naval force seeking him throughout the vast expanse of the Indian and Pacific Oceans. It was inevitable that he would eventually be discovered and defeated but he gave a great account of himself and the officers and men under his command. At the declaration of war the German squadron was more than capable of defying the British China Fleet with the only potential threat coming from the Australian Fleet then many thousand miles to the south. Von Spee was particularly wary of the Australian flagship describing her as superior to his entire force. When Japan entered the war with her huge fleet it was inevitable that the German East Asia Squadron withdraw from Tsingtao and attempt to make its way back to the Fatherland. Von Spee first brought his forces to Pagan Island in the Marianas where they reprovisioned and readied themselves to fight their way out of the Pacific. To retain the initiative von Spee devised a strategy designed to confuse and split the superior forces opposed to him. In this way his concentrated cruiser squadron would have a chance of clearing the Pacific or at least finding shelter in a neutral South American country. Emden was despatched from the main squadron to create as much noise as possible in the east of the Indian Ocean and disrupt shipping lanes. The armed merchant cruiser Prinz Eitel Friedrich was dispatched into the west of the Indian Ocean. This would divert Allied forces and permit the remainder of the squadron to move southeast away from potential Australian and Japanese forces towards the west coast of South America. For a time Allied forces were unable to locate von Spee’s squadron, but in early September 1914, it attacked the British outpost on Fanning Island and destroyed the wireless station there. On 14 September, Emden appeared in the Bay of Bengal, where she sank five merchant ships and captured a sixth. Furthermore, on 22 September she bombarded Madras and on 27 September attacked Penang and sank the Russian cruiser Zhemchug and a French destroyer Mousquet. While in the Pacific, Scharnhorst and Gneisenau bombarded Tahiti on 22 September. Emden’s luck ran out on 9 November 1914; when attempting to destroy radio installations on the Cocos Islands to the south of Java she was intercepted by the light cruiser Sydney.In the RAN’s first major engagement Emden was driven ashore and destroyed by gunfire with the loss of 136 men killed, plus 70 injured. The Australian losses were 4 killed and 16 injured. Patey believed they would take the fourth course but felt unable to act until he had definite evidence of their intentions. On 17 September 1914 Patey received a telegram from the Admiralty advising of a changing situation with the appearance of Scharnhorst and Gneisenau at Samoa and Emden in the Bay of Bengal. He was ordered to take Australia and Montcalm and cover Encounter from potential attack in New Guinea and then search for the enemy cruisers. 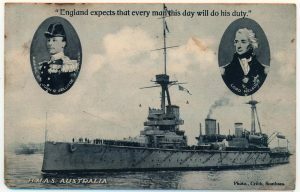 Melbourne was to be used at the Admiral’s discretion and Sydney for convoying Australian troops to Aden in company with a Royal Navy and Japanese cruisers. Hampshire and Yarmouth from the China Fleet would search for Emden. Tahiti and their light cruisers were operating off the South American coast. The Admiralty, which had received conflicting advice from British merchant ships, thought the heavy cruisers might return towards Samoa, Fiji or New Zealand. Accordingly they ordered Patey to make his headquarters at Suva. The next engagement was fought off the coast of Chile, this was the decisive Battle of Coronel on 1 November 1914. A British squadron under Rear Admiral Sir Christopher Cradock was sent to destroy the German ships. Craddock’s squadron was possibly more reliant on tradition of a naval service which had not suffered defeat in more than a century than the standard of its ships and training. The outcome was a devastating defeat with two British cruisers sunk and the remainder being forced to flee. Over 1,500 Royal Naval sailors died including the admiral while only three Germans were wounded. The euphoria did not last long as the Admiralty, stung by the defeat at Coronel, despatched a powerful squadron from the Grand Fleet to intercept the Germans. This squadron was under the command of Vice Admiral Sir Frederick Doveton Sturdee, who wore his flag in the battle-cruiser Invincible. Included in his squadron was another battle-cruiser and six cruisers. Sturdee had previously served on the Australia Station and had been the first captain of New Zealand. The two forces met off the Falkland Islands on 7 December. The German ships were now low on coal and with most of their ammunition expended were no match for the superior RN ships and were soon defeated. Admiral Von Spee went down with his flagship and perished with about 2,000 of his countrymen. The only German vessels to escape the Falklands engagement were the light cruiser Dresden and the auxiliary Seydlitz. Seydlitz fled into the Atlantic before being interned by neutral Argentina, while Dresden turned about and steamed back into the Pacific. She then took to commerce raiding without much success, until March 1915 when her engines began to fail. Without means of getting repairs, the German light cruiser sailed into neutral Chilean waters at the island of Mas a Tierra and here on 14 March she was cornered by British naval forces. After a short engagement in which four of her crew were killed Dresden was forced to scuttle with her crew interned by Chilean authorities. The AMC Prinz Eitel Friedrich had made her way from the Indian Ocean via Cape Horn into the Atlantic where she was unsuccessfully hunted by Royal Naval ships. On 10 March 1915 she sought sanctuary at the United States port of Newport, News where she was interned. In 1915 the aged light cruiser Pioneer joined the East African campaign and on 6 July in an indecisive action engaged the cruiser SMS Konigsberg and later was involved in shore bombardments. A disguised armed German raider Wolf remained at large and sank 12 Allied merchant ships and laid minefields in shipping lanes off the north of New Zealand and the south east of Australia. Wolf was never captured and her mines were not finally swept until 1918. The sailing ship Seeadler also used as a raider was more of a romantic nuisance than a threat, she eventually foundered on an atoll in the Society Islands but her crew and prisoners escaped ashore. Her captain von Luckner took an open boat to Fiji with a small party where they were captured and interned in New Zealand. The remainder escaped by capturing a passing schooner which reached Easter Island with her crew interned by the Chileans in October 1917. The United States was involved in at least one hostile encounter with Germans in the Pacific during WWI when on 7 August 1917 SMS Kormoran was scuttled at Guamto prevent her capture by the auxiliary cruiser USS Supply. potential damage before proceeding to England, arriving at Plymouth on 28 January 1915. On reaching England Australia was made flagship of the Second Battle-Cruiser Squadron in company with New Zealand and Indefatigable. Admiral Patey being senior to the upcoming star Sir David Beatty, was persuaded to accept a new posting as Commander-in-Chief of the North American and West Indies Station which included Melbourne and Sydney. Vice Admiral Patey’s flag was hauled down in Australia on 7 March 1915 although command of the Australian Fleet was not handed over to his successor Rear Admiral William Pakenham until 23 September 1916. On 1 January 1918 Sir George Patey was promoted Admiral. The British strategy of concentrating its capital ships in Home waters at the expense of its China Fleet was sound providing it gave the Japanese authority to assume Allied responsibilities in this region. Not surprisingly it was reluctant to do this and as a result a smaller German force was able to exploit a poorly implemented command structure of a much superior Allied force. The naval strategy adopted by the Allies appears disjointed and was hampered by the promotion of local enterprises for territorial gains of ex-German colonial possessions. Delays were also encountered by the reluctance of the Australian and New Zealand Governments to allow their troop transports to proceed without superior convoy protection – possibly unknown, their only potential enemy was the lone cruiser Emden.Had Patey taken Australia directly across the Pacific and joined Cradock’s squadron the disaster off Coronel might have been avoided. After the Battle of Coronel, on 15 November, the Australian Governor-General was prompted, possibly urged by Patey, to transmit a message to the British Government complaining of bungled naval strategy and time wasted over Samoa and New Guinea rather than first seeking to destroy the enemy’s ships. He reaches the conclusion that ships of the Australian and China Fleets have been ineffective owing to remote and poor Admiralty control and that this has allowed the concentration of German forces off the coast of Chile with lamentable results. These comments would not have endeared Patey to the Admiralty and have adversely affected his future career. George Patey had but one opportunity for greatness in bringing von Spee to action but this was never within his grasp. There were too many distractions, some planted by the enemy’s clever ruse which divided the Allies and had them chasing shadows. The greatest offenders were those seeking territorial gains at the expense of perusing the German squadron with all speed leading to its destruction. Patey must have been frustrated with a difficult command structure which left the Australian Naval Board virtually ineffective and, in dealing with a remote Admiralty. By the time Patey reached England he may have been past his prime and others such as Beatty, possibly with lesser talents, had found favour in seeking prized commands. Admiral Sir George Patey should be remembered as a highly proficient officer who took a fledging Australian Fleet to its new homeland and ensured it was prepared and ready to take its place as a fighting unit amongst the world’s leading naval powers. This was achieved and as our first Fleet Commander he provided a sound platform for others to follow. Not leaving a great trail of personal documents there is difficultly in judging his character, suffice to say he was intelligent, energetic and resourceful man who maintained dignity and was held in high regard by those who served with him. In January 1919, at his own request, Admiral Patey was placed on the retired list; he lived in Plymouth and died there on 5 February 1935 aged 76. His wife Lady Mary predeceased him, having died at Plymouth on 27 May 1930. 1 In May 1910 retired Admiral Sir Reginald Henderson was invited by the Australian Government to provide advice on future naval infrastructure. His somewhat optimistic report provided the blueprint for future planning of ships, depots and manpower. 2 Although officially opened in August 1915 the Panama Canal was not available to belligerent nations in the Great War until after United States participation in the war in April 1917. 3 & 4 Ironically both Triumphand Swiftsure were laid down as the Chilean battleships Constitucion and Libertad but owing to financial difficulties were bought off the stocks by the Admiralty. Bromby, Robert, German Raiders of the South Seas, Sydney: Doubleday, 1985. Carlton, Mike, First Victory 1914, Sydney: William Heinemann, 2013. Delano, Anthony, They Sang Like Kangaroos – Australia’s Tinpot Navy in the Great War,Melbourne: Arcadia, 2012. Department of Defence (Navy), An Outline of Australian Naval History, Canberra: Australian Government Publishing Service, 1976. Etherton, P.T. & Hessell Tilman, H., Japan: Mistress of the Pacific, London: Jarrolds, 1933. Fazio, Vince,Monograph– The Battlecruiser HMAS Australia – First Flagship of the Royal AustralianNavy, Sydney: Naval Historical Society of Australia, 2000. Gillett, Ross,Australian & New Zealand Warships 1914-1945, Sydney: Doubleday,1983. Grove, Eric (Ed), Great Battles of the Royal Navy, London: Bramley Books, 1994. Jane’s Fighting Ships of World War I, London, 1919. Jose, A.W.,Official History of Australia in the War of 1914-18, Vol. IX, The Royal Australian Navy,Sydney: Angus & Robertson, 1928. Newspapers – various reports from newspapers published between 1913 and 1916 in Australia, Britain, New Zealand and South Africa. Roberts, John A., Warship Monographs – Invincible Class,London: Conway, 1972. Saxon, Timothy D., Anglo-Japanese Naval Cooperation, 1914-1918,Faculty Publications and Presentations, Paper 5, 2000. ˂http://digitalcommons.liberty.edu/history_fac_pubs/5˃. Accessed 03 March 2014. Tromben-Corbalan, Carlos, The Chilean Navy: Two Centuries of Service, Sydney: Naval Historical Review, December 2013. Or close up the wall with our English dead. 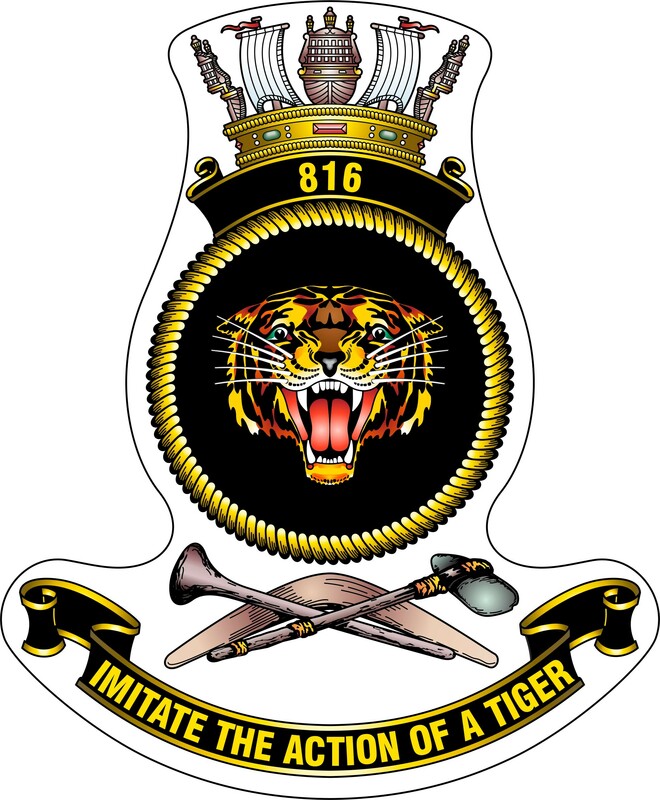 The Royal Australian Navy Fleet Air Arm Squadron 816 derives its motto “Imitate the action of the Tiger” from King Henry’s speech before the long forgotten Battle of Harfleur in August 1415. While not extending back centuries, in naval aviation terms, 816 Squadron’s history is long and distinguished with its origins stretching back to the Royal Navy where it was first commissioned as an anti-submarine squadron on 3 October 1939. Equipped with nine Fairey Swordfish torpedo bombers it notably took part in the first airborne torpedo attack of WW2. The Squadron’s affiliation with the Royal Australian Navy began on 24 August 1948 when the Squadron was commissioned at Royal Naval Air Station Eglington. 816 Squadron has since been de-commissioned and re-commissioned on a number of occasions and has operated Fairey Firefly’s, Fairey Gannets, Sea Venoms, Grumman S-2E/G Trackers; all fixed wing aircraft from the carriers HMAS Sydney and Melbourne. With HMAS Melbourne’s decommissioning 816 Squadron recommissioned as HU (Helicopter Utility) 816 Squadron on 9 February 1984 flying Wessex helicopters. HU 816 Squadron decommissioned on 30 June 1987. The Fleet Air Arm adopted USN prefixes during the early 1970s but later reverted to the Royal Naval method when the HU prefix was discontinued. Located at HMAS Albatross on the NSW south coast 816 Squadron has been at the forefront of Australian Naval Aviation for the last two decades. The Squadron is home to approximately 290 men and women who fly and maintain 16 x S-70B-2 Seahawk helicopters. The Squadron trains maintenance personnel and aircrew as well as supporting fully operational Flights at sea which are attached to a number of HMA Ships. Today’s 816 Squadron had its beginning on 8 February 1988 with the Seahawk Introduction and the formation of the Transition Unit (SITU) with the task of introducing the S-70B-2 Seahawk into the RAN. The SITU program was interrupted when on 2 August 1990 Iraq invaded Kuwait. Initially under the auspice of the United Nations Security Council Resolution 665 two Seahawk helicopters were embarked in HMA Ships Darwin and Adelaide as part of Operation Damask. HS 816 (HS – Helicopter Anti Submarine) was officially re-commissioned on 23 July 1992; although at the time it had aircraft embarked in HMA Ships Canberra and Darwin and had been operational for a number of years. 816 Squadron has for the most part kept an operational flight embarked at sea within the Middle East Operating Area (Operations Damask, Slipper, and Catalyst) for nearly 20 years. These operations have included maritime interdiction, anti smuggling operations, Naval Gunfire Support and anti terrorism protection. In 2004 POA Ben Sime (now CPOA Sime is currently serving as a Qualified Aircrewman Instructor at 816 Squadron) was awarded the Medal for Gallantry when a dhow laden with explosives detonated itself alongside USS Firebolt. An 816 Squadron Seahawk attached to HMAS Stuart was the first coalition asset on the scene and initially coordinated the rescue effort. CPOA Sime with total disregard for his own safety conducted a diver drop to provide assistance to a seriously injured American sailor. This individual act is consistent with the dedication and commitment personnel from 816 Squadron have shown whilst deployed. 816 Squadron is still to this day supporting anti piracy operations near the Horn of Africa. Since its re-commissioning, 816 Squadron has been involved in a wide variety of operations which have demonstrated the capability of the S-70B-2 and the devotion and capacity of the personnel that fly and maintain them. Other notable involvements that the Squadron has distinguished itself include; being called upon during the 1998 Sydney to Hobart Rescue effort. POA Pashley (now WOA Pashley) was awarded the Medal for Bravery and a further number of Bravery Citations were awarded to other 816 Squadron crews. In 2003 the Squadron was involved in Operation Anode (Solomon Island Assistance) and assisted Special Forces in boarding the North Korean drug ship Pong Su in April 2003 off the East Australian Coast. MIDN Gidley grew up on Sydney’s North Shore but in 2011 moved to Jindabyne in the Snowy Mountains. After completing secondary education at Sydney’s Shore School in 2007 he was accepted into the Australian Defence Force and later undertook training as an Army pilot. Unable to complete his pilot training in 2010 he transferred to the RAN as a direct entry Seaman Officer. His interests include recreational flying, vehicle modification and motorsport and he also enjoys competitive sailing and skiing. The development of aircraft propulsion through history had a significant impact on the Aviation Squadrons of the Royal Australian Navy (RAN), especially regarding the military integration of the gas turbine engine in both fixed wing and rotary wing aircraft. The development of aircraft propulsion in the mid 20th century had a profound impact on all world aviation as the gas turbine engine was introduced as an efficient and viable alternative to conventional reciprocating piston engines. This engine development entered the RAN in the form of the Sea Vampire in 19541, and continuous engine research and development brought with it new aircraft with new capabilities that helped to bring Australia on to the world stage with its aviation capability. In 1953 the RAN’s first helicopter entered service, and again, history shows the benefits of employing gas turbines as the power source to all of the RAN’s helicopters. Jet propulsion was first devised more than two thousand years ago, but was not used effectively until the 13th century in China, when gunpowder rockets were used as fireworks. Air breathing gas turbine engine development incorporating the Brayton Cycle commenced in the mid 1930s. After the resolution of countless issues relating to safety, reliability and weight, the first jet propelled aircraft, Ernst Heinkel’s He 178, flew in 19392. During World War II great advances were made in improvements to aircraft engine performance. Continued development made by the He 178 led to early operational gas turbine engines including the Caproni Campini N1 and the Japanese Tsu-11. While neither of these engines provided efficient propulsion alternatives for piston driven aircraft, they paved the way for military versions of gas turbine engines. Research breakthroughs towards the end of the war eventually led to the world’s first jet engine fighter, the Messerschmitt Me 2623. The arrival of the Me 262 into mass production marked the entry of the jet engine as an efficient and effective means of aircraft propulsion for the future. The first gas turbine aircraft flown by the RAN was the de Havilland Vampire Mk T.224. The first Sea Vampire was received on 18 June 1954 by 723 Squadron and most were used as training aircraft. Australia predominantly used variants of the Vampire aircraft in the RAAF, however the RAN flew the Vampire through 723 and 724 squadrons. Soon after acquiring of the Vampire, the RAN gained a number of de Havilland Sea Venom FAW53 aircraft. These new aircraft were comparable to the Vampire and performed a similar role. Later in their service life the Sea Venoms were used predominantly in a training role which included aircrew instruction, simulated airborne attack and the training of Direction Officers at the Pilot Branch, and also for towing targets using a Delmar Target Towing System for air-to-air training5. The Sea Venom became the RAN’s first jet propelled airborne anti-surface capability. The Australian carrier, HMAS Melbourne, equipped with Sea Venom aircraft established itself in Australia and overseas in the Pacific, the United Kingdom, and South East Asia as an efficient operational platform. 808 Squadron became known as a formidable fighter unit in its participation in the South East Asia Treaty Organisation (SEATO) exercises, and a later deployment gave 805 squadron the opportunity to perform operations from a carrier as an all weather night fighting unit. These new jet aircraft proved superior to the existing piston powered capability as they could be flown further and for longer to complete their mission. However the design of the aircraft to accommodate the higher top speed required a higher velocity on final approach, which in turn required frequent maintenance to both the aircraft and the landing platform when operating from a carrier.